Las Ramblas real estate in Las Vegas is planned for about 25 acres of commercial land between the Hard Rock Las Vegas hotel-casino and the proposed W Las Vegas Residences, Starwood’s newest Las Vegas venture that was recently announced. Las Ramblas Las Vegas is named for a pedestrian-friendly and fashionable area in Barcelona, Spain, that boasts cafes and a promenade. Las Ramblas condos in Las Vegas real estate will include more than 4,400 luxury condominium and hotel units in 11 high-rise towers, along with shops and a 48,000-square-foot casino — about half the size of the sprawling gambling floors found in the city’s others mega resorts. “This is not designed to be the next great casino of Las Vegas. This is designed to be the next great resort,” said Jim Stuart, who co-founded Las Vegas real estate developer Centra with partner Kenny Sullivan. Related Las Vegas President Marty Burger said he expects to break ground in 2006 and build in phases over the next five years. Clooney and Gerber, who’s married to model Cindy Crawford, will help design and direct the entertainment, restaurants, spa and a 300-room boutique hotel. Gerber is known for his Las Vegas nightclubs. “I wanted it to be like old Vegas and old Hollywood. 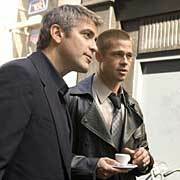 It’s going to be a classy joint,” Clooney said. Clooney said the hotel will be sophisticated and smart. Las Ramblas condominium project will include a movie theater for holding Hollywood movie premieres. Call 702-505-6988 for VIP Las Vegas condominium buyer representation by a Las Vegas real estate agent. Las Ramblas Las Vegas Condos announced by actor George Clooney.